This week I am going to post multiple pictures in five separate photoblogging articles. Because of my circumstances I tend to just have pictures from the modern areas of Jerusalem, the predominantly Jewish and Westernish sites throughout the city. I put up pictures of silly Hebrew signs and unique occurrences on the street. As representative of my day to day experiences these can be, they fail to relay one part of my life that is just as important to me. I like to tour through Arab areas. 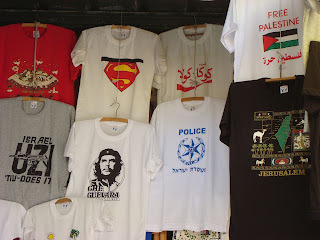 I go into East Jerusalem sometimes. I often find myself in Arab neighborhoods. I have been through the West Bank, deep into what most would consider dangerous territory. 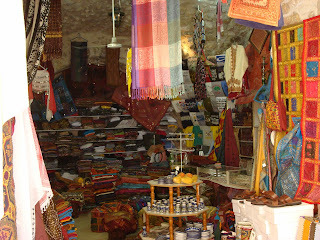 And, of course, I love to walk the Arab/Muslim streets of the Old City here in Jerusalem. Trust me, I'm always very safe and objective in these trips. Click on the pictures to see larger size! Magnificent at the city's gates (1530s). 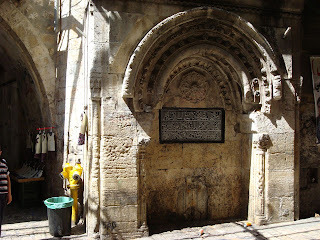 throughout the Old City. They are written in a fancy, cursive Arabic. 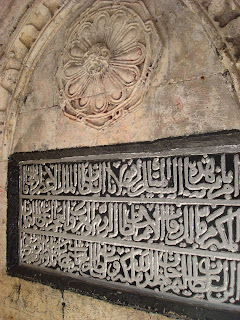 I think they're among the most beautiful treasures in all of Jerusalem. just how close I was, though. 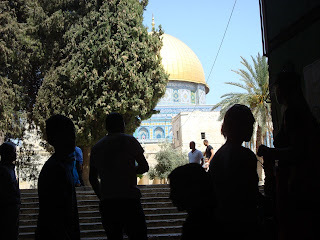 The Dome of the Rock loomed overhead. Those shirts look pretty f'ing cool. Too bad their profits go to the maniac warmongering Israeli government! Uh, Julia, not sure you actually read the introduction or description.... this is in the Muslim Quarter of the Old City. The owner may or may not even be an Israeli citizen, probably isn't in fact, and anyway the profits go to the owner.... an Arab. I think julia was perturbed by the fact you put "oppressed Palestine" in quotes. It's too bad she jumped on you like that, because she may have had a point had she stuck to the topic. You don't have to be Muslim to go up to the Temple Mount. You enter on the Kotel side, up the ramp. There are signs to direct you for certain hours, days, etc. It's an amazing place. Bring your camera! Namaste - Good point, you are correct. At this time, however, I believe the Temple Mount was closed? I remember it being closed sometime around then. But you are correct, from the Kotel you can enter. You know, I lived in Israel for 4 years and I never went up there. I regret that, but will do it someday!